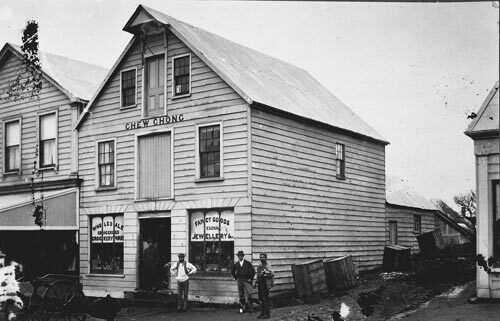 Before becoming involved in the dairy industry, entrepreneur Chew Chong ran this general store in New Plymouth. Local dairy farmers often bartered butter for store goods, but because of poor processing, much of it spoiled when exported. To improve butter processing, Chew Chong opened one of New Zealand’s first dairy factories, in Taranaki in 1887. This item must not be copied or reproduced in any print or electronic media without the prior permission of Puke Ariki Museum and Library. It is the responsibility of the user of any material to obtain clearance from the copyright holder.